the Way of St. James was one of the most important Christian pilgrimages in Middle Ages. Many people still follow it as a form of spiritual path, but it is also popular just as a beautiful long-distance hiking or cycling route. Whatever was the reason for this walk, many people say that it changed their lives. The Camino de Santiago, sometimes referred to as The Way of St. James, is the name of any pilgrimage route that lead to the Shrine of the Apostle St. James the Great in the Cathedral of Santiago de Compostela in northwestern Spain. The most popular route is Camino Frances (The French Way), but is also the busiest. The longest route is Via de la Plata, and the shortest one is Camino Ingles (The English Way). 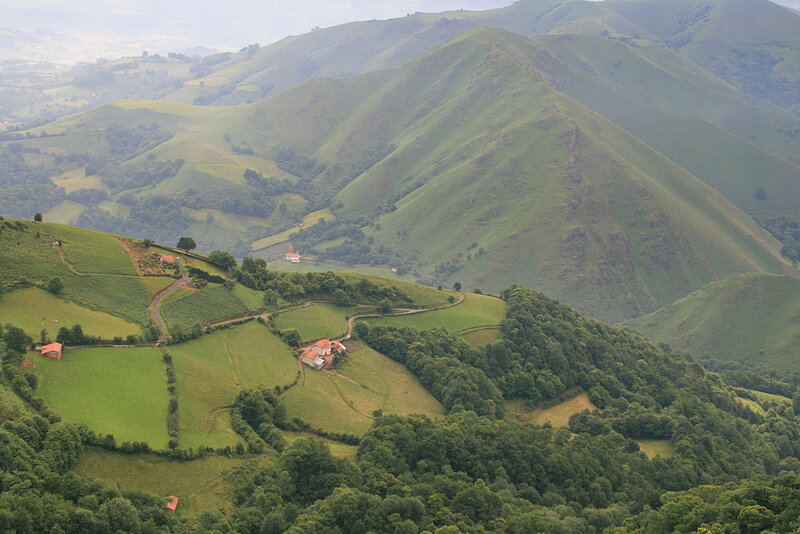 Camino Frances officially starts in Saint-Jean-Pied-de-Port, on the French side of the Pyrenees. It passes over the Pyrenees, and then through the north of Spain to the Santiago de Compostela. The whole route is 790km long and can be completed in 1 month to 5 weeks, but many choose to do only the last section of the route (160km). This final section of Camino Frances starts in O Cabreiro in the mountains, and while you descend to the village of Triacastela, you can enjoy the beautiful mountain views. The route then continues through the forests to Sarria, and then passing through the traditional Galician towns and villages you get to Portomarin. You then pass through Palas de Rei, Melide, Arzúa and A Rua, to the final destination, Santiago de Compostela, a UNESCO World Heritage Site. Unlike many long distance routes that avoid large towns and villages, this route passes through many settlements where you can find shelter and food. Join all the pilgrims who have been walking the Camino for thousands of years in search of peace and relaxation. Say a prayer in the Cathedral where the remains of the apostle St James are believed to be buried. Experience the beautiful landscapes, charming little towns and unique local culture. Enjoy the wonderful Galician cuisine. With most travel agencies, you can choose the difficulty to suit your level of fitness. More precisely, you can choose the duration of the daily walking time and trail types. The terrain itself isn’t technically difficult, and while there are some parts with steeper climbing, you can avoid them by choosing the easier route, without mountain trails. Day 2 – Descend from the mountains of Galicia, down the hills of Sierra de Rañadoiro, and finish in the village of Triacastela. Day 3 – Walk up to the 910m-high plateau of Alto do Riocabo before descending via small settlements towards Sarria. Day 4 – From Sarria, through the countryside and valley of the river Miño, to Portomarin. Day 5 – Climbing through the woodlands near Portomarin and over the hills of the Sierra Ligonde, and then up the little hill of Alto Rosario from where you arrive to Palas de Rei. Day 6 – Easy walking along the woodland paths to Melide. Day 7 – Easy walking across three shallow river valleys to the 14th century chapel of La Magdalena in the town of Arzúa. Day 8 – Part where all other routes join the Camino Frances. Walk through the quiet hamlets to La Rua. Day 9 – The last day of the Camino. Through villages and woodlands you arrive to the village of Lavacolla, where pilgrims traditionally washed themselves after weeks or months of travelling. After that you finally arrive at the destination, the old town of Santiago de Compostela. Day 10 – Departure from Santiago de Compostela. For more information or to book this or many other adventures visit HillWalk Tours.